Hastings Priory coach Ian Gillespie praised a ‘superb performance’ after Elliot Hooper became the cricket club’s first player to take eight wickets in a first team game for three years. 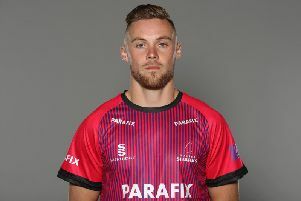 The left-arm spinner returned figures of 8-50 from 23.5 overs during Priory’s 20-run defeat away to new Sussex Cricket League Premier Division leaders Brighton & Hove last weekend. Adam Pye steams in against Roffey on Sunday. Gillespie said: “It was absolutely superb. It was a wicket that was helpful to spin bowling, but on a hot day, to sustain that for such a long period of time was very good. Adam Barton, incidentally, was the last Priory player to claim eight wickets when he took 8-24 in a Division Two match at home to Ifield in August 2015. Despite the heroics of Hooper, who also effected a run out and scored 37 off 32 balls with the bat, Priory suffered a narrow defeat which has made their survival bid even more difficult. Jed O'Brien turns his arm over at Horntye Park on Sunday. They head into the last third of the league campaign second-bottom of the table and 40 points adrift of a Middleton side which occupies the final safe spot of third-bottom. Next up for Priory today (Saturday) is a local derby at home to a third-placed Eastbourne side which continued its fabulous season by amassing 331-5 declared during last weekend’s win at home to Ifield. Priory still feel they missed an opportunity in May’s reverse fixture at The Saffrons as Eastbourne recovered from 44-4 to triumph by 121 runs. “We should’ve won last time,” added Gillespie. “We don’t want to lose to Eastbourne and we need to win. There will be a bit of pride at stake. Hooper is unavailable due to a family holiday and the injured Barton is likely to remain sidelined for around two weeks, but Ryan Hoadley and Harry Scowen are due back from holiday. Play will get underway from 12noon at Horntye Park.